When it comes to household appliances, everyone has an opinion. In fact, between friends and relatives, you’re likely to receive conflicting advice on the best maintenance or operating tips. With today’s technology, your household appliances are several steps ahead of the mustard yellow washer or the avocado green refrigerator of the early 1980s. At one time, a cold-water cycle truly didn’t thoroughly clean clothes. But today, washers are designed to run more efficiently and effectively. That means that a load of clothes can be cleaned in a cold-water cycle – even whites. Using cold water is not only effective, but cost saving as well. Hot water uses close to 90 percent of a washer’s energy. How many times did your mom tell you to rinse the dishes before placing them in the dishwasher? At one time, it was a necessary first step to ensure clean dishes, but not anymore. Many dishwashers have turbidity sensors to determine if there are suspended particles in the dishwasher. Clean dishes limit the suspended particles, and in effect, cause the dishwasher to run a shorter, colder cycle. Time to buy a new refrigerator, so what to do with the old one. If you think it’s cost effective to use an old refrigerator as a second fridge for outdoor storage, think again. An old refrigerator, especially one more than 10 years old, can actually cost more than a new refrigerator over the long term. According to the Energy Star website, replacing an old refrigerator that is more than 10 years old with an Energy Star rated fridge can save anywhere from $200 – $1,100 on energy costs. All Sub-Zero refrigerators carry the Energy Star seal. To find out your savings with an Energy Star refrigerator, click here. To get the best brisket, you have to sear the meat at a high temperature. And in some kitchens, that also means blaring fire alarms from ensuing smoke. Don’t wait for the billowing smoke before you turn on the ventilation; instead, have it on approximately 10 minutes before you even begin to cook and then at least five minutes afterward. Some vents, like the Wolf Low-Profile Island Hood, have a heat sentry feature that senses heat to automatically turn on the unit and adjust blower speed. Not sure if your range ventilation offers this feature? 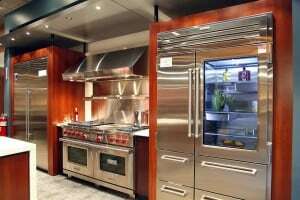 Contact a factory certified Subzero & Wolf appliance repair service provider. When it comes to your household appliances, the best rule of thumb is to work with your certified appliance service provider. After all, who knows appliances better? With more than 60 years of exceptional service to its North Texas and San Antonio customers, C&W Appliance Service can not only answer your questions, but provide insight and advice on how to best maintain your appliances. C&W is the only factory certified Subzero & Wolf appliance repair service provider in Dallas, Fort Worth and San Antonio. Call (855) 358-1496.